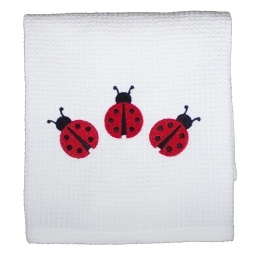 This wonderful Ladybug Gift Collection includes an embroidered Ladybug Apron, an embroidered Ladybug Kitchen Towel, and a colorful Ladybug Pot Holder. All of these items are handsomely arranged in a white gift box lined with Ladybug Tissue tied with a red ribbon. Makes an impressive gift! Approximately 8.5 inches by 11 inches by 1.75 inches wrapped.